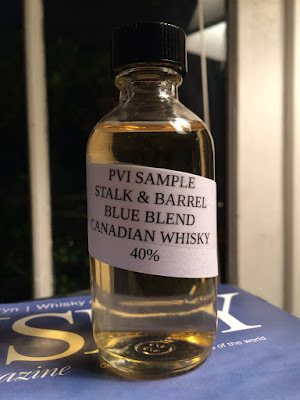 Stalk and Barrel Blue Blend (40.0%): Still Waters Distillery from Ontario, Canada is one of my favorite North American distilleries of the last decade. Their whiskies are consistent in style which I happened to like a lot and you know that you won't be surprised in any new release they bottle. They just get better in time... I like their single malts, ryes and blends they bottled in past years but didn't have a chance to taste their Red and Blue Blends which were released last fall. Thanks to Raj Sabharwal and PVI Global I received both samples a couple weeks ago and will start with the blue blend today... It is a blend of rye, single malt and corn whiskies and replaced the white label blend in their portfolio so far I know. Palate: Very thin on the palate as well... It is a light and easygoing whisky. Reminds me the light whiskeys from MGP. Underripe Concorde pears and Honeycrisp apples. Some watered down rye whisky notes: nutmeg, cinnamon and green wood. Orange bitters, lemon bars and caramel fillings. Finish: You would think that it will be short but it's not short. Starts with lemon juice and fade out with white pepper. Warming. Overall: It is a sweet and mellow everyday whisky. I would say it is in the same category with young Scotch blends with high grain whisky content and like I mentioned above with American light whiskeys. I can see how easy it would fit in every possible highball or how refreshing it would be in a tumbler with a lot of ice. It's created for it... If I had a bottle at home I would save it for summer afternoons. I didn't even think of adding water by the way. It's good as it is... Thanks again to Raj Sabharwal and PVI Global for the sample.